From left to right: Gabriella Rowe, Catherine DeLazzero and Richard Robbins are new members of Community Board 7. UPPER WEST SIDE — Nine new members will be joining the ranks of Community Board 7, including those with expertise in technology, education and life on the Upper West Side, the Manhattan Borough President's office said. Competition was stiff for membership to CB7 — 78 people applied, the most of any Manhattan board, Brewer's office said. The application involved not only a written portion, but also role-playing exercises to see how potential board members interact with each other, members explained. "I’m excited about all of them," said board chairwoman Elizabeth Caputo of the nine newbies, many of whom are longtime residents. New member Richard Robbins, 44, who has lived in the neighborhood since 2002, is hoping to increase civic engagement with the board through technology, he said. "I have enjoyed watching our elected officials respond to constituents using social media and feel that we've barely scratched the surface of ways that regular citizens can use technology to become active in civic matters," he said. Robbins is a father of two and the founder and CEO of the new tech consulting firm, Upper West Strategies. Helping the board reach more people is also the mission of new member Catherine DeLazzero. DeLazzero, 35, a professor in writing at Teacher's College and a neighborhood resident since 2005, said she's interested in bridging the digital divide and better involving residents who don't have regular access to computers. "I’m really interested in how the community board could do more outreach and do more communication directly with the community," she said. Both DeLazzero and Robbins also see an opportunity to use technology to connect with people who aren't able to attend meetings. "As a father of two young children who is starting my own business, I know that it can be difficult for community members to attend board meetings," Robbins said. DeLazzero wants to explore live-streaming meetings and also providing online video of the meetings after they happen. Robbins also hopes to make an impact promoting safer streets, he said. He lives in the West 90s, where a series of pedestrian fatalities occurred this winter. Among the other new members is Gabriella Rowe, 48, the head of the Mandell School, who was also a member in the recent past. Audrey Isaacs, a member of the political club Community Free Democrats, and Polly Spain, residents' association president of NYCHA's Wise Towers complex, are also joining the board. 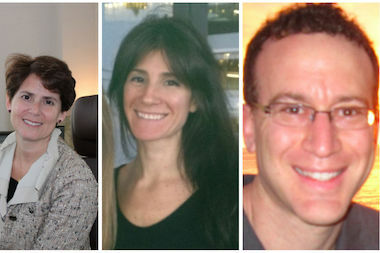 Steven Brown, Rita Genn, David Sasscer and Jeanette Rausch made up the other new members joining the board. While some members were booted from the Upper East Side's Community Board 8 based on poor attendance records, all of the 21 existing CB7 members who re-applied this year kept their seats. Caputo is encouraging new board members to attend as many committee meetings as they can in the next month to see which ones appeal to them. Once the board's needs and members' desires are considered, she'll sign off on committee assignments in June. The Transportation Committee, which weighs in on local infrastructure changes by the Department of Transportation, is one of the most popular committees, as is the Business and Consumer Issues committee, which hears liquor license applications before they go before the State Liquor Authority, said Caputo. But a slew of board members who stepped down recently have left holes in the Education Committee and the Parks Committee, she said. Marisa Maack, former chairwoman of the Education Committee, is now City Councilwoman Helen Rosenthal's chief of staff. Rosenthal also stepped down from the board when she took office, leaving vacancies on the Land Use and Education committees. In February, longtime board member Elizabeth Starkey retired after decades serving as the Parks Committee co-chair. Other members have left because of conflicts of interest, relocation and new jobs, among other reasons. Caputo said she was pleased with how much time Brewer's office spent considering the committee vacancies. "[The new members] bring a great diversity of interests and geography and knowledge of the neighborhood to the board," Caputo said.